Please Click Here to make a tax-deductible donation today. Thank you! Gjøa’s philosophy has always been to provide soccer training to as many children as possible, regardless of their financial possibilities. Therefore, over 30 players are currently playing for various teams on a partial or full scholarship. 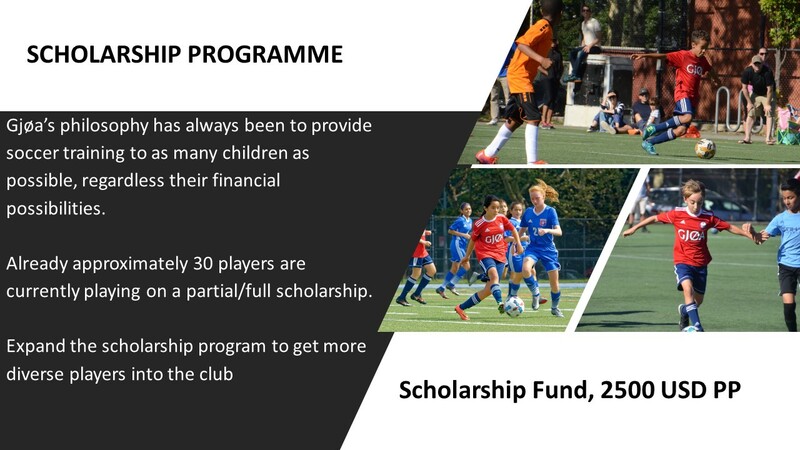 The club wants to increase this number and see the scholarship program as a way of getting talented and more diverse players into the club. Your contribution would go a long way to help children who cannot afford the high fees of the pay-to-play soccer system, but who still have a passion for the sport. Even though we are a non-profit club, we need more help to support players within this system. All contribution are tax-deductible.